Papilloedema is optic disc swelling, is usually bilateral, caused by increased intracranial pressure. When papilledema is found on fundoscopy, further evaluation is warranted as vision loss can occur if the underlying cause of raised ICP not removed. Cause of raised ICT can be any SOL like hematoma, abscess, neoplasm, Cerebral odema or without any cause as in Idiopathic Intracranial Hypertension. Unilateral Papilloedema is rare may suggest intra orbital or isolated optic nerve pathology. Further evaluation with a CT or MRI of the brain is usually performed to rule out intracranial pathology. MRI is favoured over CT due to its excellent soft tissue resolution as far as optic nerve, its diameter and signal is concerned, plus its ability to discriminate optic nerve sheath complex from Optic nerve. Patients with Papilloedema shows dilatation of subarachnoid space around Optic nerves on MRI. As the optic nerve sheath is continuous with the subarachnoid space of the brain and is regarded as an extension of the intracranial subarachnoid space, increased ICP is transmitted through to the optic nerve. The diameter of the optic subarachnoid space correlates with the intracranial pressure, and may be an indication for increased intracranial pressure, can be used as a non invasive method over lumbar puncture. 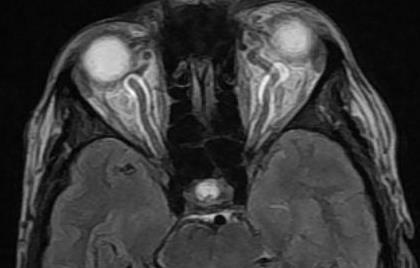 The dilated subarachnoid space around the optic nerve is best visualized using MRI Fat suppressed T2 w imaging. Most the time subjective evaluation is sufficient to mention the dilatation of Optic nerve sheath. Optic nerve sheath to Optic nerve diameter ratio can be used as an objective method where outer diameter of optic nerve sheath divided by Optic nerve diameter at the level of maximum dilatation on coronal T2 sections. Ratios of 2.5 or more suggest significant dilatation of subarachnoid space around optic nerve and reflect raised ICT.